If you know me, you will not be surprised to hear that I’m obsessed with a book about yoga. The thing is, it’s not just a book about yoga; it is THE book about yoga. I’ve borrowed it from (several) libraries dozens of times, bought it for myself and others, and talked about this book to so many people that, frankly, people are starting to drift away at cocktail parties when I bring it up. But since I assume that most of the readers of this post are librarians, I’ll continue on. If you’ve appreciated the proliferation of yoga classes in contemporary culture, you might have this author to thank for it. Bellur Krishnamachar Sundararaja (B.K.S.) Iyengar is considered the father of modern yoga and the teacher that opened the door to yoga to the Western world. Called “Guruji” by millions of devoted followers, he was honored with a Google doodle showing him in yoga poses last year on what would have been his 97th birthday to celebrate his practicing, teaching and writing about yoga for more than seventy-five years. It has been said that B.K.S. 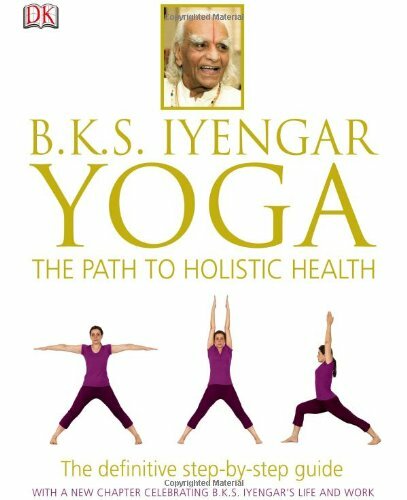 Iyengar could hold a headstand for nearly half an hour well into his eighties. He died in 2014 at the age of 95. This book provides concise information on the history and philosophy of yoga, but the bulk of the book is devoted to photos and text on how to practice the classic yoga postures (asanas). The book promises: “Yoga is for everyone. You do not need to be an expert or at the peak of physical fitness to practice the asanas described in this book…This book focuses on techniques, so that even a beginner will have a thorough understanding of how to practice the asanas in order to obtain the maximum benefit. By using a few simple props, students with different capabilities can gradually build up strength, confidence, and flexibility without the threat of strain or injury.” And it delivers on this promise with step-by-step instruction on each asana, featuring photos from different angles. The instruction stresses proper alignment and breathing, with variations from beginner to advanced practitioner. The section on Yoga Therapy offers specific asanas to treat specific ailments by rejuvenating the body and then addressing the cause of the ailment. I can attest to the fact that I have come to the mat with a backache and left without it, but the book stresses the importance of steady, consistent, sequential practice—no quick fixes here. PS: If you wonder why I have had to borrow it from several libraries, it’s heavy (large format, 400+ pages, 4.2 pounds) and I don’t take it with me when I travel—but I can’t seem to go more than a few sessions on the mat without referring to it. So wherever I travel, I have to have it. Thank you public libraries across the country for loaning me this great book. Thanks for the recommendation. There’s a lot of content and I’m working my way through it. Love your assessment — the book stresses the importance of steady, consistent, sequential practice—no quick fixes here. Definitely! Hmm…not a librarian, but I really appreciate the review. I will have to borrow and / or purchase it myself! Thanks for the overview and great recommendation.